When you enter the voting booth, you may see a notice bearing down on you which says: "PLEASE DO NOT MARK ANYTHING ELSE ON YOUR BALLOT PAPER: IT MAY NOT BE COUNTED." At the 2017 General election (8 June 2017) we want all those people who think their votes don't count to get out and spoil their votes. A mass movement of spoiled votes will broadcast a new message: the choices on offer are just not good enough. We demand something better - a different way of doing things. A mass movement of spoiled votes will broadcast a new message: the choices on offer are just not good enough. We demand something better - a different way of doing things. Your spoiled vote will be counted, by law, along with the votes for candidates. It’s NOT a wasted vote. It’s NOT a wasted vote. That’s the point of the campaign. When votes are cast, and the result is announced, the returning officer reads the number of votes for each candidate AND the number of spoilt papers. 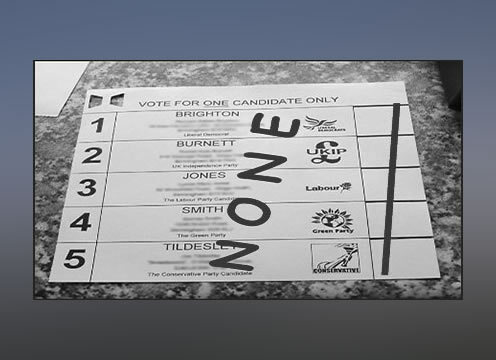 We’ve even been told that spoil ballots are shown to the candidates. The trouble is that the number, or meaning, of spoilt ballots is rarely reported in the press and media. And in the UK, this has never been seen as a way in which people who feel alienated and disenfranchised, can make their point. It is seen, instead, as either a mistake (someone didn’t know where to put their cross) or as a destructive and irresponsible action by people who only know what they’re against. Which is ironic, in the current situation, where large numbers of people don’t vote at all, or are likely to vote negatively. This is what the 2017 Campaign wants to change. To introduce the concept of a spoilt vote, as a positive option at the ballot box. To provide a vote for those people not provided with a choice. To provide a barometer so we can measure the health of our democratic systems. What's the strategy here? Even if millions of people spoil their ballot paper, what difference would that make? What would happen then? Spoiling your vote is only a minor player in achieving a different way to do things. Change will rest on many other developments and actions, some of which are already taking place. Some change will come from people working within the current establishment and some from outside. Many approaches are needed. But this should not stop you from joining the Campaign. The butterfly effect is at work here: a small flutter in the air may lead to a bigger wind for change. We don’t know exactly what will happen if we’re successful. But we do know that an alternative is needed. A mass movement of spoilt ballot papers will, at the very least, create a serious debate about this new voice from the electorate. A discussion that may lead to practical changes - for example a different way to vote so that more interests are represented in Parliament – or to changes in the political culture of the UK – for example a greater sense of accountability and engagement. What is more worrying: to allow the current direction of travel to continue unchecked? Or to step into some uncertainty with the chance for change?